TORONTO (AP) After Toronto’s bench players started the fourth quarter with a bang, Raptors coach Dwane Casey let them keep playing until the final buzzer. 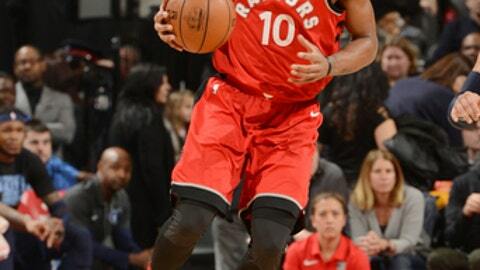 Delon Wright scored 15 points, DeMar DeRozan and Fred VanVleet each had 13 and the Raptors pulled away in the fourth to beat Memphis 101-86 on Sunday, their fifth straight home win over the slumping Grizzlies. Toronto outscored Memphis 52-19 in bench points. DeRozan said he was grateful for the effort from the bench, especially because of the rare noon tip-off time. Jonas Valanciunas scored 12 points, Kyle Lowry had 11 and Pascal Siakam 10 as the Raptors improved to 21-4 at home, the best record in the NBA. Toronto’s reserves opened the fourth with a 12-4 run, turning a two-point edge into a double-digit lead with 7 1/2 minutes remaining. Toronto is 14-3 when VanVleet scores 10 or more points. He matched his career high with seven rebounds and had eight assists. ”We were always chasing our tail,” Gasol said of a fourth quarter in which the Grizzlies were outscored 25-12. Dillon Brooks scored 12 points and JaMychal Green had 11 as Memphis lost for the sixth time in eight games. Memphis shot 3 for 22 in the fourth, and half its points in the quarter came at the free throw line. ”We got bogged down a little bit, couldn’t find a way to create any easy baskets and we struggled to score,” Grizzlies interim coach J.B. Bickerstaff said. The Raptors shot 3 for 26 from 3-point range through the first three quarters but went 3 for 9 from long range in the fourth. Toronto finished 6 for 35, its lowest percentage from 3-point range this season (17.1 percent). Grizzlies: G Tyreke Evans missed his third straight game. Evans is away from the team amid speculation he will soon be traded. … Memphis is 5-19 on the road. … The Grizzlies had 19 turnovers. Their season high is 24. Raptors: CJ Miles returned after missing the previous three games because of a sore right knee. … Valanciunas has scored 10 or more points in seven straight games, a season-high stretch. Brooks, who was born in the Toronto suburb of Mississauga, made his first NBA appearance in his home country. Some 50 friends and family attended the game. ”It’s just a dream come true to play at Air Canada Centre, where you’re from, where you watched since you were seven years old,” Brooks said. Grizzlies: Wrap up a four-game road trip at Atlanta on Tuesday. Raptors: Host Boston on Tuesday. Toronto has won four straight home meetings with the Celtics.